More Than 100 Dead In China Poultry Plant Blaze : The Two-Way A state-run newspaper reports that all but one of the doors at the processing plant in northeast Jilin province was locked when flames broke out. The fire is one of the country's deadliest industrial accidents in recent years. In this photo released by China's Xinhua News Agency, smoke rises from a poultry farm owned by Jilin Baoyuanfeng Poultry Company in Jilin province on Monday. 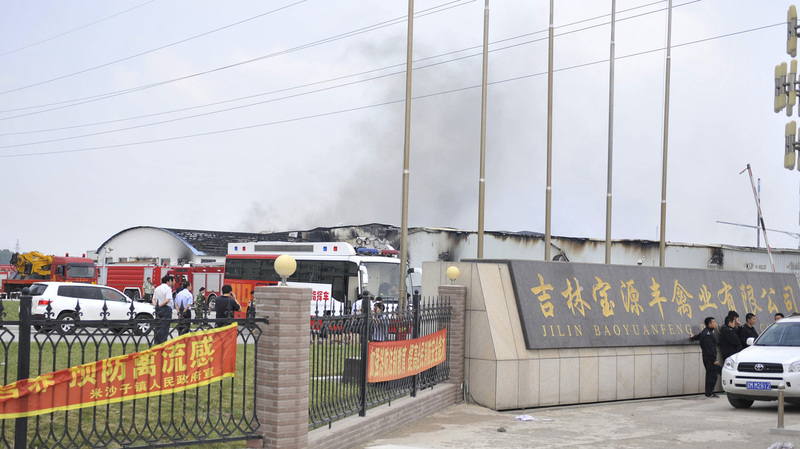 A fire at a poultry processing plant fire in northeast China on Monday has killed at least 119 people, according to the Jilin province government. The blaze is one of the country's deadliest industrial accidents in recent years. Flames broke out a little after 6 a.m. and the sprawling, low-slung plant filled with dark smoke, witnesses said. About 300 workers were inside the facility owned by the Jilin Baoyuanfeng Poultry Company in Mishazi Township of Dehui City. The state-run newspaper Southern Metropolis reports that all but one of the plant's doors were locked at the time. People's Daily, the Communist Party's mouthpiece, said the plant routinely locked doors during work hours to "more conveniently manage workers on a daily-basis." The plant's complex interior and narrow exits also made rescue more difficult, according to the state-run New China News Service. If the reports about locked doors turn out to be accurate, Monday's tragedy would recall another incident two decades ago in China that made headlines around the world. In November 1993, a fire broke out in the Zhili toy factory in the southern Chinese boom town of Shenzhen. Worried about workers stealing toys, factory managers put bars over windows and locked exits. Most of the 87 workers who died were found in heaps in front of the locked exits, according to China Labor Bulletin, a workers' rights organization in Hong Kong. Worker safety in the developing world has been a big issue of late. More than 1,100 laborers died in a garment factory collapse in Bangladesh on April 24. The government said the factory was poorly constructed and a "disaster waiting to happen." Chinese labor conditions have been heavily criticized over the years, but officials say worker deaths here have actually declined. The government's latest figures show annual deaths in the mining and industrial sectors dropped below 10,000 for the first time two years ago.